Ageing Oven (IPC Model) - S.S. Instruments Pvt. Ltd. 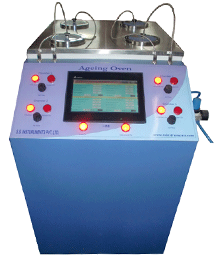 Thermal Ageing Test Instrument helps in study of Ageing Process on various material. Thermoplastic and Poly Vinyl Chloride substances when exposed to heat undergo many types of physical and chemical changes. The extent and type of change that takes place depends upon the severity of exposure of the sample to heat (i.e., temp. range), duration and rate of air flow. Report : Average temperature / Air Flow / RPM along with complete data can be saved in pdf format. Packing : One Wooden Box, 52 x 40 x 52 (LBH in inches), Weight 250 kg. Thermoplastic and Poly Vinyl Chloride substances when exposed to heat undergo many types of physical and chemical changes. The extent and type of change that takes place depends upon the severity of exposure of the sample to heat (i.e., temp. range), duration and rate of air flow. This test makes an assessment of change in Tensile Strength and Elongation of the material on subjecting them to accelerated ageing in hot air. We are using a combination of two RTD to control the Chamber Temperature. Two RTD are placed approx 100mm apart. The PLC picks the temperature reading from these RTD sensor and average them. This average temperature is used for controlling the chamber temperature. The Thermal Ageing Test Instrument uses IPC (Industrial PC) with 500 GB hard disk. All the data from the four chambers is collected in the IPC and is used to generate result at the end of the test. 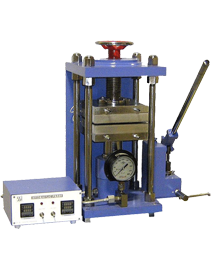 The Test result provides the average temperature, air flow, air temperature and agitator RPM over the complete test period. It also generates complete DATA Table and DATA Graph for the test period. All the result files can be saved in a pdf format and printed for future reference. In this model of Thermal Ageing Test Instrument each Cell is a complete instrument in itself i.e., fitted with individual Temp. Indicating Controller, Air Flow Meter, Air temperature controller and an Hour Meter. This enables the user to test different type of samples at desired temperature and duration, depending upon test requirement of end users &amp; testing authorities. A IPC (Industrial PC) with touch screen is provided to control and Monitor the instrument. The IPC is a complete computer with windows, hand hard drive. This gives the instrument capability to store all the data form the test and present te same in pdf format. Initially the operator is promoted to set the values using ‘Input Panel’ through IPC . The operator can then monitor the each chamber using ‘Test Panel’ wherein all the set and present values of the parameters are displayed. The parameters are also displayed using graphical and data representation. Digital Flow meter for monitoring the volume of air passing through the chamber. Air inlet nozzle for the airline or air compressor. Specially designed cover to hold three to five test samples in each chamber. Timer System to record the total time of test.